On Sunday morning, shortly before leaving for the early service, I turned on the news and heard about the mass shooting in Orlando. At that point, the estimate was twenty dead and forty-two wounded. Then, just before the ten o'clock service, a parishioner showed me an update on his smart phone. The estimate was fifty dead and over fifty wounded. All I could think of to do was to add the victims of this horrific act of violence to the Prayers of the People. For the past two days, when I have had an opportunity to watch the news, read responses, and ponder what happened, I have felt an overwhelming sense of sadness and loss. Sadness for those killed and injured, their loved ones, friends, and colleagues, for my country that seems to have lost its way. Loss of a way of life, of a sense of security, of civility in public discourse, and of effective leadership in public office. A friend asked me in a Facebook post why someone's faith would make them murder in cold blood. I don't think he liked my response because it included looking at the implications of our own faith and for placing stronger restrictions on certain kinds of guns. James told us, "For as the body without the spirit is dead, so faith without works is dead also" (James 2:26). Our trust in God and the beliefs we have about God's will for humanity should lead to action. Our faith should lead us in renewed efforts to "persevere in resisting evil", "strive for justice and peace among all people, and respect the dignity of every human being," and all the other imperatives of the Baptismal Covenant. We have a Christian duty to live our lives according to the example of Christ and to proclaim the good news. Yet, there are those who are both inside and outside our Christian community over whom we have little or no influence. Just as there are those of other faiths who twist the teachings of those faiths, so there are those within the Christian community who have perverted and abused the Gospel. There are people in all faiths who embrace an archaic interpretation of teachings and who rail against more contemporary and progressive viewpoints. Faith communities are struggling internally and externally in the context of a global cultural change. I believe that change is inevitable and that people of faith have an opportunity to contribute in positive ways to the new cultural ethos that emerges. But we will not succeed in that positive contribution through means that are in conflict with the primary values of world religions that call for peace, love, and well-being that supersede images of violence and hatred in our sacred texts. Neither shooting dozens of LGBT people in a nightclub, nor inciting fear and conflict in political statements, nor being a "murderer at heart" (1 John 3:15) are pleasing in the sight of God. So, let us resolve to resist all of these things that harm God's children and work for common sense measures that are for the common good within our faith communities, across the lines that divide us, and within the body politic. I don't have all the answers. Neither do you. But we do have a faith that promises God can work through us to bring peace and goodwill. It will be hard work. If there were simple solutions, we'd have already prevented tragedies like the massacre in Orlando. So, let us join hands, listen to one another, and get to work. All the while, let us pray for those who have died, those who suffer, those who are our neighbors, and those who are our enemies, in the hope that God's will may be done on earth as it is in heaven. Gracious God, preserver of all things in heaven and earth, receive the souls of those murdered in Orlando into the arms of your mercy; envelop the Orlando community with your love; and grant us all--Christian and Muslim brothers and sisters--the courage and wisdom to speak with one voice in favor of your peace, which passes all understanding. Amen. I’m attending the Interim Ministry Network Annual Conference this week in Las Vegas. One of our speakers shared a story about compassion. Professor Mead explained that healed femurs are not found where the law of the jungle reigns. A healed femur shows that someone cared for the injured, did that person’s hunting and gathering, stayed with that person, offered protection and companionship, until the injury could mend. Evidence of compassion, says Mead, is the first sign of civilization. By way of a parallel, the same thing is true within the Church. The first sign of Christian civilization/community is not preaching, music, theology, or organization. Rather, the first sign of Christian civilization/community is compassion - how well we care for those who are wounded or injured in body or spirit, how well we rally around a person in a time of need, how we offer healing, comfort, protection, and companionship until they are able to rise up and walk again. I reflected throughout the day on compassion as a sign of civilized society in general and Christian civilization/community in particular. I saw many signs of compassion. Perhaps that was because I was looking for them. A group of us went out to dinner and when we returned to our hotel it was 102º. This hotel is a sprawling complex of buildings and my room is about three blocks from the lobby. As I was going to my room, I noticed an elderly lady pushing her walker. The walker had a seat on it and on the seat was an ice bucket. I spoke to her and she said, “Do you know where the ice machine is? It is so hot and I need some ice water.” I took her ice bucket and told her to wait right there. I filled her bucket with ice from the machine, which was about 50 yards away, and returned it to her. She thanked me three times before I was able to continue on the walk to my room. For her, it was a great relief. For me, getting her some ice was no big deal. It took less than two minutes. But those two minutes changed me. I felt more alive, more human, and more connected to the civilization/community of Christians. I share this with you in the hope that you will take a little more time to watch for and to perform acts of compassion. It is one way to love your neighbor as yourself. Even more, it is a way to advance civilization and change the world. I’ve been thinking about glory. Where does it come from? Who is entitled to it? Where does glory fit into the Christian faith and life? Perhaps you’ve heard it said, “There’s no telling what can be accomplished if doesn’t matter who gets the glory.” It’s an important proverb for any work group, family, or organization where teamwork and collaboration are important. I’ll go you one better: “There’s no telling what can be accomplished if God gets the glory.” The emphasis in my version of the proverb is not only upon selflessness and teamwork. The emphasis is on giving God the credit for what we accomplish. It’s really a fairly simple yet profound concept. Human beings were created in the image of God to be the crowning glory of God’s creation. The glory, therefore, belongs to God. It is our privilege and purpose to glorify God and, when possible, to inspire others to do so as well. Glorifying God is our mission, our delight, and our ultimate purpose. Our aim is to do everything for God's glory to the exclusion of our own self-glorification and pride. Christians are to be motivated and inspired by God's glory and not their own. Musicians such as Bach and Handel dedicated their music by writing Soli Deo Gloria (Glory to God alone) on their manuscripts. After writing to the Galatian Christians about his life and witness, St. Paul concludes with, “And they glorified God because of me” (Galatians 1:24). Everybody needs a pat on the back from time to time. It is good to affirm and recognize others in our lives. But the highest compliment we can pay others is to let them know their life has inspired us to give glory to God. P.S. Here is Patrick Doyle's setting of that first verse of Psalm 115, composed for the movie "Henry V." The Latin Non Nobis Domine = Not to us, O Lord, not to us, but to your Name give glory. The Holy Trinity is a doctrine, a teaching, developed over time by the Church as an aspect of the unfolding revelation of God derived from, but not confined to the pages of sacred scripture. We have a need to know who created the universe and placed us in it. In response, the Church tells us that it is the Lord God Almighty who is the Creator and Parent of all life and being. We see God’s hand at work in the world around us. It is powerful, though only a glimpse. To see God face to face is something we hope for and long for and live for. We also need to know that we have a source of forgiveness and understanding that will not let us down. In our declaration of the divinity of Jesus Christ, we are saying that God sees us not just from the viewpoint of a loving Creator/Parent, but with redemptive concern as well. God’s reason for dealing with us in Jesus Christ is to offer us forgiveness of sin, release from guilt, to reconcile us, and draw us closer to the ultimate purpose for all creation. And, we need to know that we have a friend who is near, always able to sustain our faith, bind us together in worship, and empower us in God’s mission. So, we proclaim that God is the Holy Spirit, ever present in our midst for guidance, comfort, and strength. As St. Paul says, the Spirit of God bears witness with our spirit that we are children of God and heirs with Christ of God’s amazing grace (Romans 8:16, 17). The Holy Trinity: Three expressions of how One Living God relates to everything and everyone in the universe. More than a theory, it is a teaching given to us to help us better to know who God is, how God loves us, and how God abides with us. Enjoy just about everybody's favorite hymn about the Holy Trinity. 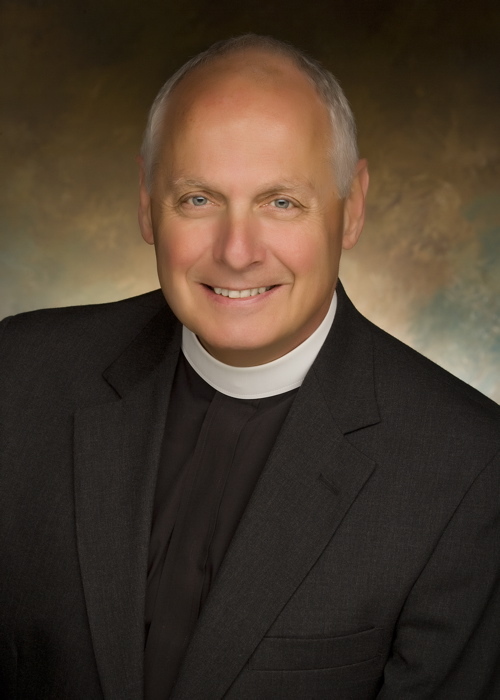 Let me begin this week’s reflection by saying how excited Gay and I are about the new Rector of St. John’s Church! Jimmy and Cindy Bartz, along with Jas and Jade are perfect for this parish and community. The Search Committee and Vestry have discerned wisely. And, I am now able to tell you that Gay and I will be moving to Denver at the end of June where I will serve as Interim Dean of St. John’s Cathedral. This will be a very different challenge and blessings you have given to us during our time with you will make a difference in our life there. Now, let’s reflect on Pentecost. Jesus gave a breath of fresh air to his disciples. On the first Easter Day, he came into the place where the disciples were, breathed on them and said, “Receive the Holy Spirit.” It was this same breath of fresh air the disciples received on the Day of Pentecost, 50 days after the resurrection. This Holy Breath in turn came out of the apostles that day as they witnessed and preached so that those around them heard in their own languages. On this Day of Pentecost, I’m here to tell you we dare not take this spiritual breathing for granted because the quality of our breathing affects the quality of our lives – our health, moods, energy, creativity. Likewise, our spiritual lives are dependent upon the breath of God supplying the invisible virtues that are necessary for spiritual health, moods, energy, and creativity. If we are constantly putting ourselves in a place where we can breathe in the Breath of God together, it will not be long before we will be breathing out the Breath of God in the world around us. Magnifying Christ and proclaiming the good news of what God has done, offering hope in the face of despair, peace in the face of hatred, comfort in the face of pain and suffering, and the eternal God in the face of the uncertainties of human existence. Elizabeth Barrett Browning once wrote, “He lives most life whoever breathes most air.” Jesus breathed on them and said, “Receive the Holy Spirit.” Let us make a new resolve to join with one another in the greatest deep breathing exercise ever known – to receive the Holy Spirit, let our lives bear the Spirit’s fruit, dream dreams, see visions, and experience the mighty works of God first-hand by becoming one of them! P.S. Here is one of my favorite hymns about the Holy Spirit, "Come Down, O Love Divine," sung by the Choir of King's College, Cambridge. I've included the text beneath the video. and o'er its own shortcomings weeps with loathing. The Very Reverend Ronald D. Pogue, D.Min. And all creation praises the Creator!